I like my eggs Sunny-side up, and ideally, with runny yolk but fully firmed up whites (including a millimeter-thin film of cooked yolk/whites on top of the yolk - not sure if there's a technical term for that). This seems like an incredibly difficult balance - either the whole yolk starts to harden (very quickly - enough to get distracted for 15 seconds), or the whites are still runny and the yolk top is not cooked. I tried covering my frying pan with a cover (helped a bit) and cooking over lower gas for a bit longer (didn't help much). Moderate heat, eggs at room temperature, non-stick egg pan (8" is good, with gently sloping sides) with a tight lid. Melt butter in the egg pan until it stops foaming. Crack your eggs into a bowl so you've got more control when you add them to the egg pan. Cook uncovered until just the bottoms of the white are set, the tops of the whites should still be transparent. Add 1Tbs water for two eggs, cover, check after 45 seconds and give the eggs a jiggle to be sure they will slide neatly out of the pan. They may be ready at this point, they may need another 30 seconds to a minute. My pan isn't ideal, I'd rather have 8", this one is 10" but it has a lid. My eggs are at room temperature, I have butter ready and a tablespoon of water. A heat-proof rubber spatula is nice to have, but if everything goes right you don't even need it. I turn the heat to 1 click out of 10 below medium (YMMV [Your Mileage May Vary]). After giving the burner and pan a couple of minutes to heat up it should take room temperature butter about 10 seconds to fully melt and another 5 seconds to stop sizzling. One thing that I like about cracking eggs into a bowl first is that it allows me to better center the yolks. The whites should start to become opaque almost immediately, but they shouldn't take on any brown color or be sizzling hard, just gently. 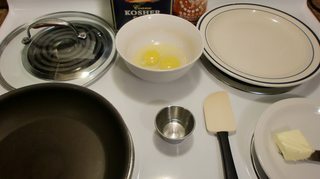 Once the bottoms of the eggs are completely opaque (this should take less than 30 seconds), add the water and cover immediately. Now the eggs are steaming. 10 more seconds under the lid, slide onto the plate. Voilà, completely set whites, completely runny yolks. OOPS, I forgot the tiny bit of white on top. That's easy, using a spoon, give the eggs a quick baste of the hot butter before adding water and placing the lid. You can also just steam the eggs until the yolks have a bit of opaque white on top with or without basting them. With practice you can control just how done you get your yolks on a scale that runs between totally runny, to creamy, to still translucent looking but nearly solid, to dry and crumbly (after piercing the yolk, usually). Flipping is a different technique to get a very similar result. One more quick note: You may notice that I used quite a bit of butter. That's just personal preference when my jeans are fitting just fine. You may use much less butter if you prefer, another type of fat, or even just a spray of non-stick spray (Pam). If you use a minimum amount of fat, or even none, the "check and jiggle" step becomes even more important. Make sure you can slide the eggs around in the pan. If they're sticking at all, this is when the heat-proof rubber (silicone) spatula can be very helpful. When you break the eggs into the pan, you will notice that the yolks are surrounded by a higher rounded portion of whites. The secret is to take your fingers and pinch this pile of whites gently until it breaks and the whites in this membrane will redistribute evenly in the pan. You will not have this rounded extra thick area of white that takes longer to cook than the rest of the whites. Once this is done I cover the pan and cook on a medium low flame until the whites are cooked. I think you will find that this solves your problem of the whites taking forever to cook. Turn up the heat. When the yolk is lying on top of the whites, the whites conduct heat to it while cooking. 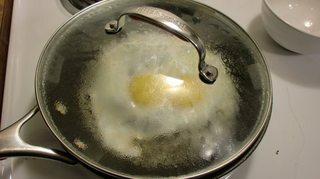 If you use a hotter pan, the whites won't have conducted much heat to the yolk. Use older eggs. Fresh egg whites are firm, older ones are more liquid. If you use fresh eggs, the whites layer will be thicker, and there will not only be a difference in the doneness between yolk and white, but also within the white itself. If you cook until the top layer of the white is done, the bottom layer will be overfried. Use colder eggs. Then you have a larger thermal gradient between the yolk centre and the pan-heated whites. If you don't mind using tricks: separate the whites from the yolk. Put a pinch of cream of tartar into the whites, and stir them until uniformly liquid. Don't use a whisk or a mixer with baloon beaters, you don't want to beat air into the yolks. Pour the whites into the pan, the whole yolks on top. 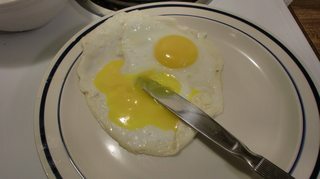 The acid will cause the whites to firm up quicker, leaving you with a colder, so non-firm, yolk. As for the thin cooked layer on top, I can't imagine it being possible in an open pan, you need heat coming from above for that. A closed pan is a much better idea. Frying the bottom in the pan first, then holding them for a few seconds under a grill or going over them with a gas torch will probably work better, but is also more hassle. And yes, you recognized correctly that it is a difficult balance. All types of fried egg dish are quite hard to master (if you are looking for a specific quality, of course; a homogenous mass of rubbery texture is easy for everybody) and when you can do it, it will require constant watching without distractions. There is no way around that. Eggs are chemically complex, and cooking them is a very precise process with low tolerances. What I do is turn on the broil setting on my oven before I put the eggs into the frying pan. I fry the eggs on the stove over low/medium heat for a few minutes, until only the top layer of white is uncooked. Then I just slip the frying pan into the broiling drawer for maybe two minutes, and it finishes off the rest of the whites, leaving that "film" of white you're talking about over the runny yolks. I've found this technique to be basically foolproof. I separate the white and yolk. I put the yolk on my plate. I cook the whites and then put the cooked whites on top of the raw yolks...to me, this tastes the best and comes out consistent every time. I crack two eggs into the med-heat skillet, and as soon as the eggs are able to be moved around in the pan, I gently pour them into another skillet already heated turning them over in the process being careful not to rupture the yolks. Add salt and pepper and cook about one to two more minutes and then pour onto a plate. The whites are just barely set and the yolks are runny. I put 1tbsp of hot butter in skillet and then i crack egg into pan. I keep swirling the yolk around until the whites are spread thin and cooking. Eventually the yolk is totally seperated and rolling around freely. The whotes are easy to cook when coating bottom of 12" pan but it takes butter. Then i roll the yoke out of pan and reconstruct with the cooked whites. Usually on top of a hash brown. How do I make a fried egg with completely cooked white but completely runny yolk? 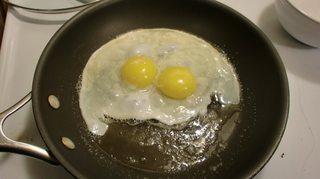 “Frying” an egg in soy souce? What's the right way to hard boil eggs? What's the best method for preparing a smoked cod roe breakfast? What's best: boil eggs in advance or just before use? What oil/fat is best for basting sunny-side-up eggs? How to add water/milk to the sunny side up eggs? 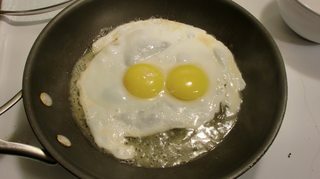 Can one use cooked egg to make fried eggs (sunny side up)? What is the term for 'sunny side up' omelette?